Scholars, librarians, archivists, publishers and research funders, to name a few, find a common place at FORCE2016 Conference, Portland, Oregon, USA. The conference themed “Building Bridges, Connecting Knowledge”, was all about topics like visualization of science and scholarship, transparency in research workflows, and the importance of effective communication both within and beyond academia. 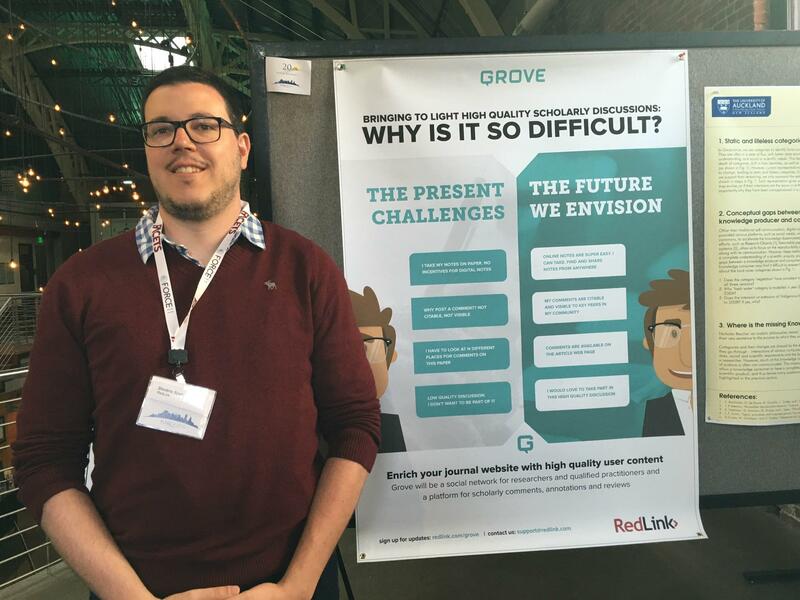 RedLink introduced Grove, a social network for researchers and qualified practitioners, at the poster session of the conference. Click here to download the poster. Researchers and scholars frequently have informed opinions about what they read and what they like to discuss it with peers. However, this information is seldom published online; most of it is expressed in private face-to-face discussions in conferences, documented in personal offline notes or it is just never recorded. This poster focuses on the question of what are the major challenges towards bringing this content to light and identifies the ideas for addressing some of them. Some of the important barriers in publishing opinions are (a) lack of credit and motivation for researchers to post comments online, (b) reluctance to publicly express opinions that might include criticism to the work of peers within the same community, (c) confusion by multiple versions of the same article. Creating a safe and trusted environment to express opinions is the solution to break these barriers. Firstly, this calls for scholarly collaboration to ensure high-quality discussions. Secondly, technology solutions should enable smooth user experiences for readers, annotators and commenters. Finally, there should be research visibility and credit to researchers for their contribution for posting online. Grove is a solution capable of bringing the disinterested scholars and researchers to have a lively discussion over journal websites. Comments, discussions and reviews can happen openly now on this social network, giving each of them the credibility they deserve for presenting their valuable opinions forward. As a result, Grove generates a huge traffic to the journal websites and scholarly engagement with the scholarly content. Grove allows social media sign-ins (ORCID, LinkedIn, etc.) and helps in distribution of journal articles that contain informative comments, polls, Q&A, discussions and peer reviews after they are published. No plug-ins are required for enabling Grove in any journal website. Grove not only helps develop good social relations between scholars and qualified practitioners, but also improves the quality of the content of academic journals online.